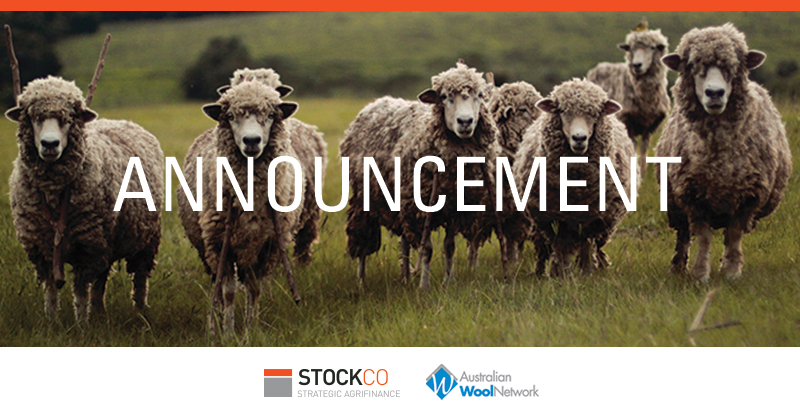 StockCo and Australian Wool Network (AWN) are pleased to announce an exciting partnership that will provide AWN’s extensive customer base with access to StockCo’s strategic livestock funding solutions. Through entering a distribution agreement, AWN will now be able to offer StockCo’s innovative livestock funding solutions directly to their customer base. StockCo is Australia’s largest specialist livestock funder with a solid record of providing innovative livestock funding solutions in Australia and New Zealand since 1995. These funding facilities offer assistance with financing the purchase of sheep and cattle for backgrounding, finishing or trading purposes and are available to fund livestock in both feedlots and on pasture. As part of this service, StockCo will fund 100% of the purchase price and only requires payment of the purchase price and accrued finance charges once livestock is sold. In most cases, StockCo will only take direct security over the livestock being purchased. AWN is Australia’s largest independent wool broker offering a range of wool marketing and selling services. As such, AWN is the only wool marketing company with its own Australian-based wool manufacturing facility and a dedicated retail presence to market its client’s wool directly to consumers. AWN and its subsidiary in WA, Dyson Jones, markets in excess of 275,000 bales of wool across Australia for some 8,000 woolgrowers and has specialist wool buying activities in NSW, VIC, TAS and SA. The company’s core business is focused on delivering value to its client base by embracing innovations and establishing strategic alliances that will deliver financial benefits to its client base. For more information visit www.stockco.com.au or contact your local AWN Wool & Sheep Specialist.